-- Select a Size -- Size 8 Size 10 Size 12 Size 14 - Out of Stock! Size 16 - Out of Stock! Size 18 Size 20 Size 22 - Out of Stock! Size 24 - Out of Stock! Size 26 - Out of Stock! Size 28 - Out of Stock! With printed blue tartan brushed fleece on the outside and cozy, solid gray fleece on the inside, this jacket is sure to provide optimum warmth. 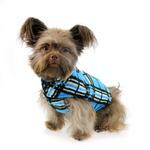 T-Fit chest panel featured on sizes 8-20 have two points of adjustability to fit more doggy shapes. 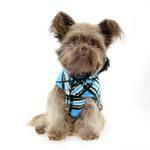 Whistler Winter Dog Coat - Blue Tartan Customer Photos - Send us your photo! Rosie is a black mouth cur mix from Texas. Adopted thru Eleventh Hour Rescue. She goes to doggie day camp once a week and has picked up a few boyfriends there. What a flirt. She is almost 2 now. Posted On 01/17/19 by marilyn k from costa mesa, CA Yes, marilyn k recommends this product! I love this coat for my pug Wilson. It keeps him very warm. It fits him perfect except for one issue, when he goes to the bathroom, the underband is too close and he gets it wet. So then I have to take it off of him. Other than that I would recommend it. Be sure to take your dogs measurements when making a purchase. Posted On 12/28/18 by Laura B from La Mesa, CA Yes, Laura B recommends this product! We already had this coat in tan and ordered this one to have an extra. Our boxer mix loves it and so do we. It washes easily and dries quickly. The fit is excellent and the material quality is also excellent. Easy to put on and off. Our boxer comes to the coat to have it put on, and is clearly warm and comfortable. Thank you! Posted On 11/10/18 by Loriann P from Chesapeake , VA Yes, Loriann P recommends this product! Love this gorgeous jacket!! I have one by this brand that has outlasted all other jackets. The fleece does not pill at all. I have so many that look terrible that have cost more than this one. I bought one for all of my dogs. Posted On 11/22/17 by Carol L from Millington , NJ Yes, Carol L recommends this product! Bought this coat last year when my rescue was an 8 month old puppy. She’s nearing 2 now and at 95 lbs needed an upgrade. Bought this again two sizes larger and she loves it. Fits her well, and keeps her warm, but not overheated. Very well made and smart looking. We get complements on it wherever we go. 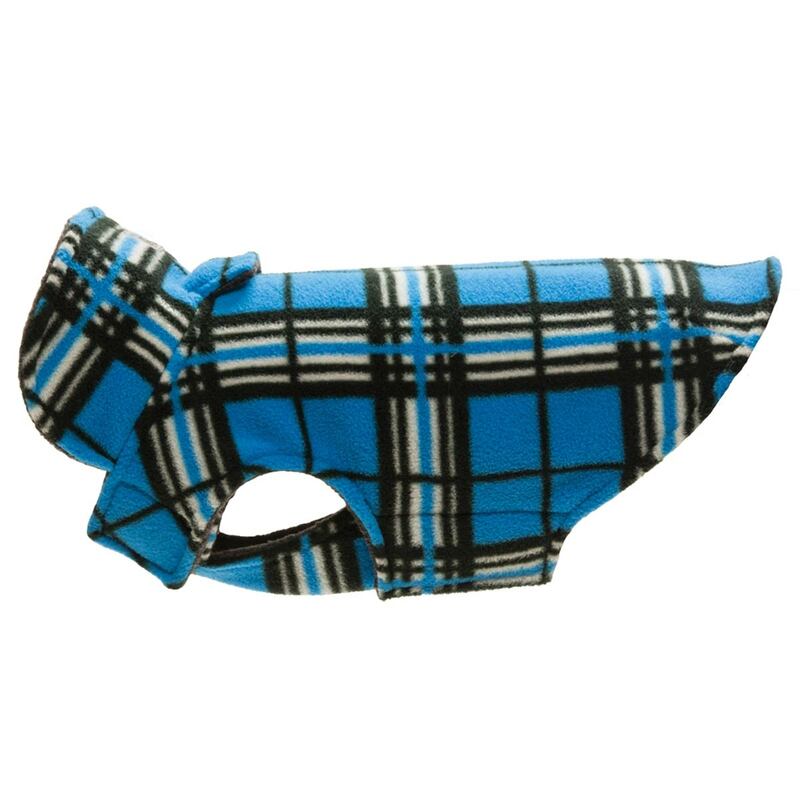 These are awesome, comfy fit, keeps puppy warm, I have it in every boy color. Love the double layer fleece - they are so cozy! Posted On 01/20/17 by lynne s from East Moriches, NY Yes, lynne s recommends this product! Only four stars because of how it closes. It is a beautiful color & well made as well. Posted On 12/20/15 by Janet L from Lone Tree, CO Yes, Janet L recommends this product! This is an easy to put on dog coat. My dog Zack looks great in it! I had to return the first one because it was too small. I find that I often have to go a size larger than what is indicated. BaxterBoo has great dog clothing. It's my go to site! Posted On 12/07/15 by Kathryn S from Green Bay, WI Yes, Kathryn S recommends this product! My boston terrier Howie loves this! It's think and cozy. He doesn't want me to take it off! This coat is great. All the aspects of this coat was just what I was looking for. Both my dogs don't have a lot of hair (of course you can't tell that when you look at my house! ), this jacket is going to keep them warm when we venture out this winter! The color, material, Velcro and fit was perfect. Posted On 09/03/15 by Lacy J from , Yes, Lacy J recommends this product! warm and cute as can be, my pup gets so excited as soon as you touch her jacket. she doesn't mind staying out for a little bit of a longer walk with this one during the colder nights. Plus it has plenty of room in the back for the jacket to stay clean while she goes potty.